Metal or fixed braces is the traditional method of treating crooked teeth or teeth that are not properly aligned. 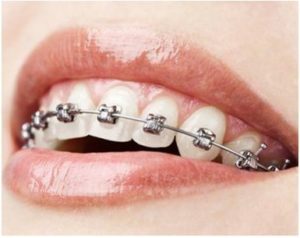 Although, now there are many other braces available these days but metallic braces are still a treatment that is trusted by many because of its adaptability and great results. Fixed braces are a proven solution to most of the orthodontic problems and provide results which other new treatment methods can’t. The metal braces are visible to others when you open your mouth to talk, eat or smile. Step-By-Step Process for Metal Braces? 1. First of all, during the first meeting with the patient, our orthodontist analyzes whether the fixed braces will be the best possible treatment for you or not. 2. An x-ray and diagnostic impressions of your teeth are taken to prepare for the treatment. 3. In the next appointment, the metallic braces will be fixed to your teeth. 4. Our orthodontist suggests that you visit us regularly (every 4-6 weeks) so as to check the effectiveness of metal braces on your teeth. 5. Once the treatment is completed, retainers are given to you for using so that your teeth remain in the right shape and position.